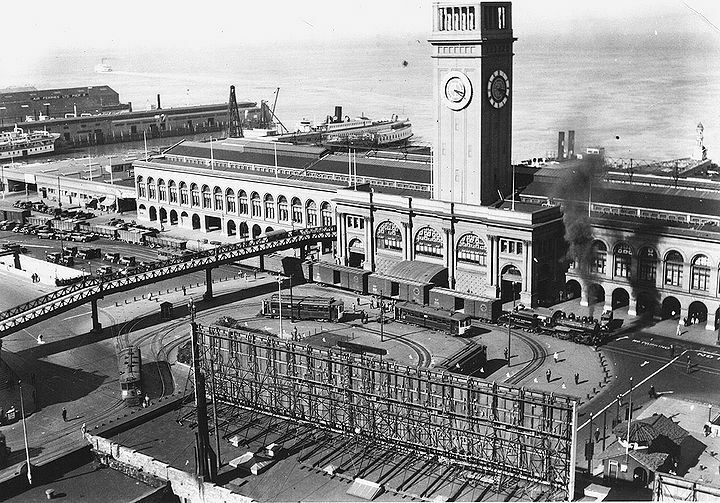 Ferry Building with state-owned Belt Line Railroad crossing in front, old pedestrian overpass still present, c. 1930. 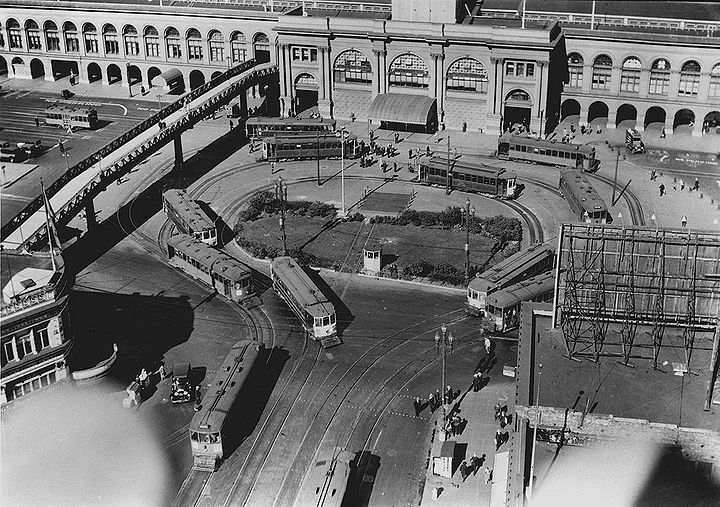 Northeast view across Ferry Building plaza from top of Southern Pacific building at Steuart and Market, March 28, 1930. 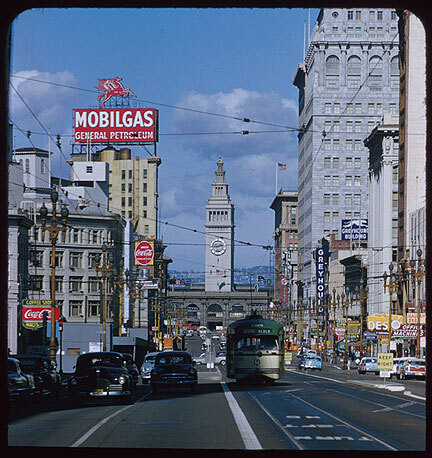 March 31, 1957 view down Market Street from apx. 3rd Street. March 31, 1957, from apx. 2nd Street. 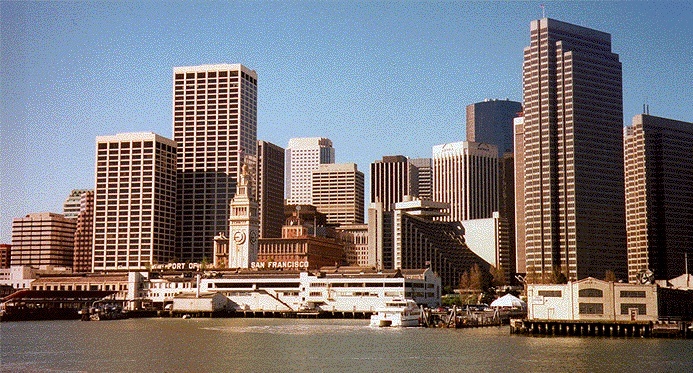 Ferry Building disappearing among the towering highrises of the Financial District, 2007. 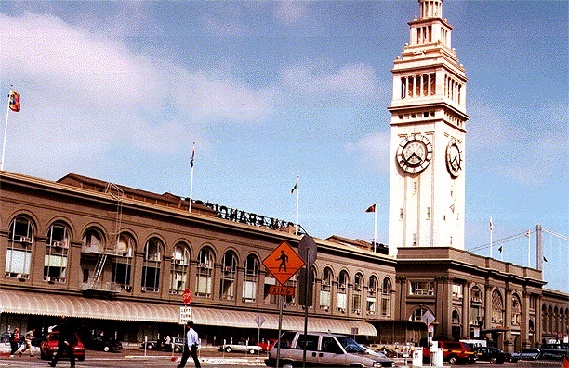 In 1992, a demonstration was held offshore the Ferry Building to protest the U.S. government's policy of forced repatriation of Haitian refugees and detention of HIV-positive refugees. As part of the demonstration, forty Haitian activists took a sailboat from Berkeley to San Francisco, an action which the INS misunderstood as a smuggling operation. As one hundred and fifty other demonstrators watched from the shore, a Coast Guard vessel and helicopter intercepted the boat. The Haitian demonstrators were detained by police for an hour, and protesters were not allowed to continue the rally until they had shown proof of proper documentation. The demonstration was organized by various groups, including the Bay Area Haitian American Council, Bay Area Peace Navy, ACT UP San Francisco, Global Exchange and the Coalition for Immigrant and Refugee Rights. 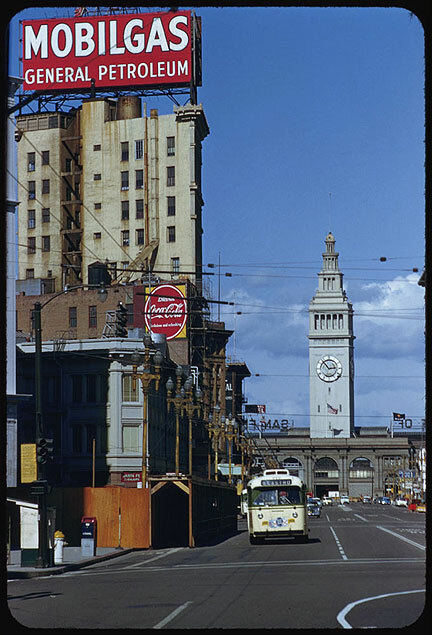 Market Street in 1940 with the Ferry building at the foot. 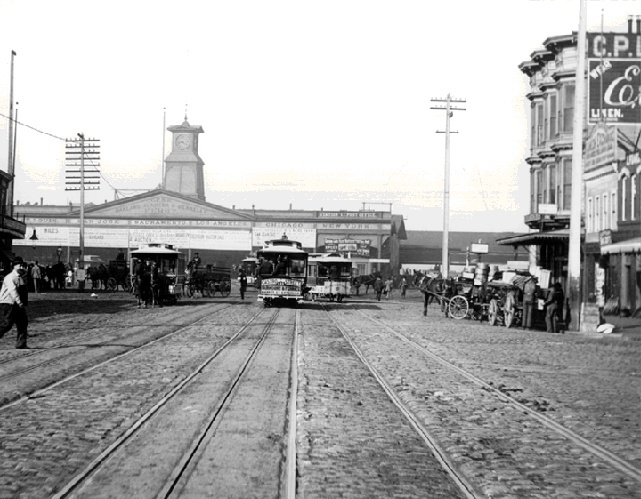 Notice the multiple tracks for streetcars. In 1908, an American named Durham Stevens was employed by the Japanese government to calm U.S. business fears about Japanese rule over Korea. His statements justifying Japanese rule, stating that the Koreans welcomed and benefited from the Japanese protectorate, were printed in the San Francisco newspaper, and the Korean community, infuriated, demanded that he retract them. 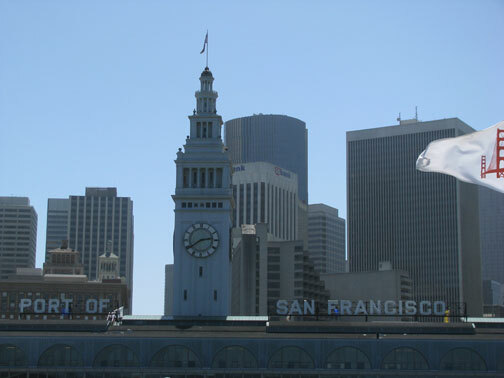 A group of angry Koreans confronted Stevens in front of the Ferry Building on March 23, and one of them, Chang In-hwan, shot and killed Stevens. Chang was sent to prison, and his case became a cause celebre among the Korean community who viewed him as a national hero, a patriot and martyr for the nationalist cause. Money for the defense of his case came from Korea, Japan, Siberia, Manchuria, Mexico, and the U.S. The first Korean immigrants came between 1902 and 1905, recruited for labor in Hawaii. Less than 2,000 settled in the mainland, mostly in California with a small community in San Francisco. Like other immigrant groups, they set up institutions such as churches, businesses, and political groups. Korea was annexed by the Japanese in 1905, and many overseas Korean communities, including those in San Francisco, agitated for liberation. The current wave of Korean immigration began after the 1965 Immigration Act, which dismantled quotas and based immigration on family reunification. In addition to family ties from the earlier wave, Korean brides of U.S. GIs from the Korean War also provided many of the first anchors for this migration. 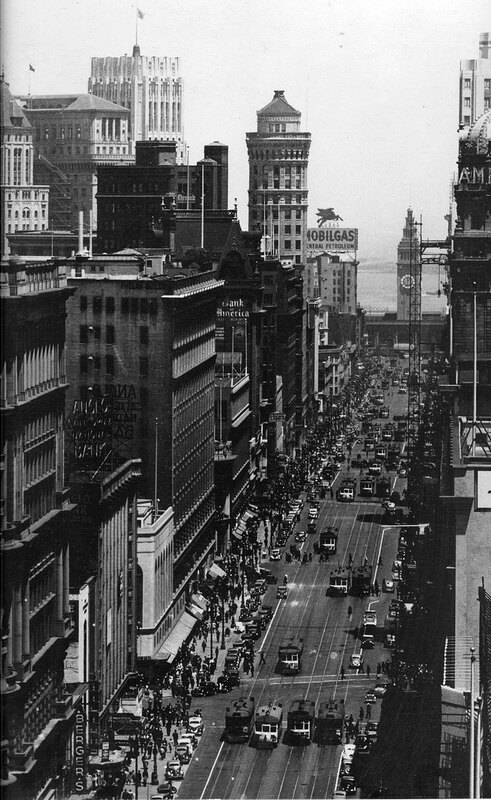 On a clear day, if you stand on the corner of Market and Kearny, you can see both ends of Market Street: To the northeast, it butts up against the Ferry Building, whose signature tower is a replica of the cathedral of Seville; and to the southwest, it rises up into the hills of Twin Peaks, often disappearing into great banks of fog spilling over the broadcast towers. Market Street is the San Francisco version of Main Street, U.S.A. It's the hub of the local transit system, the street of reference after which the "South of Market" district was named, the thoroughfare where "suits" (conventionally-attired businessmen), more casually-dressed tourists, and even more casually-dressed street people mingle and blend into that uniquely San Francisco human amalgam. 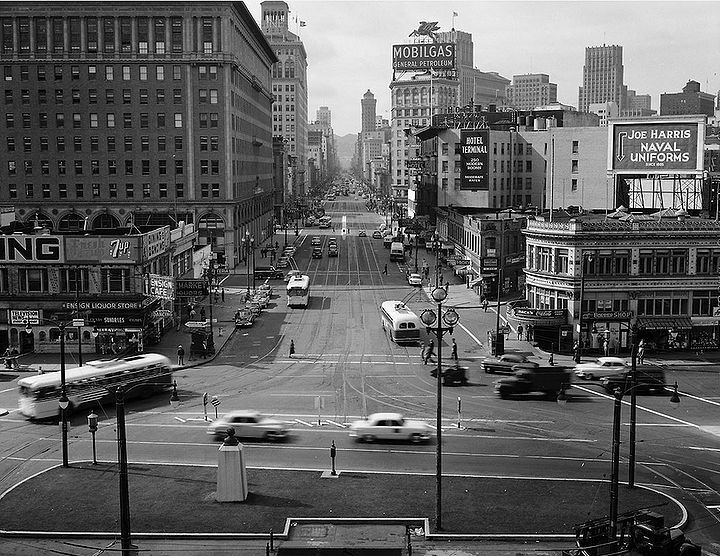 Though you wouldn't necessary guess it--or maybe you would--the surveyor who laid out Market Street was nearly lynched for his efforts. The Dublin Irishman Cashel Boyle O'Connor Fitzmaurice Tisdall O'Farrell, for whom O'Farrell Street is named, made the first exhaustive survey of San Francisco in 1847. 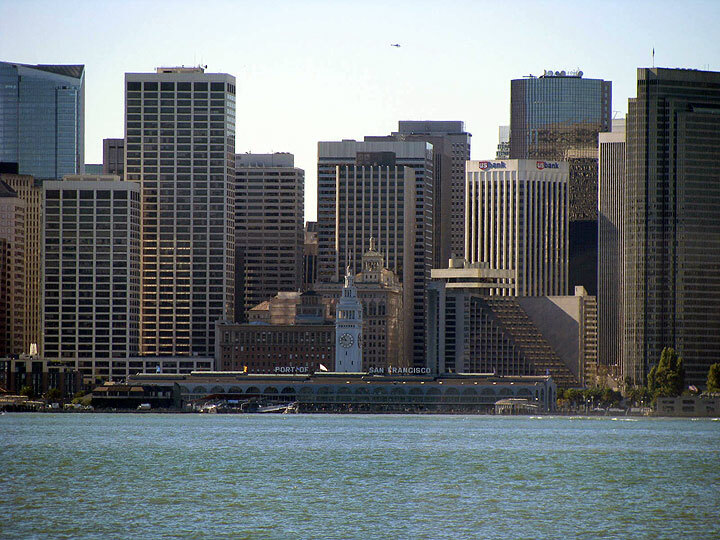 When O'Farrell arbitrarily made Market Street unusually wide, thereby disinheriting various proprietors of their holdings, a lynching party was quickly organized; but before it reached the intended victim's house, O'Farrell had fled aboard the Sausalito Ferry. The surveyor remained in Sausalito until the mob gave up.